Binaural cue coding (BCC) is an efficient technique for spatial audio rendering by using the side information such as interchannel level difference (ICLD), interchannel time difference (ICTD), and interchannel correlation (ICC). Of the side information, the ICTD plays an important role to the auditory spatial image. However, inaccurate estimation of the ICTD may lead to the audio quality degradation. In this paper, we develop a novel ICTD estimation algorithm based on the nonuniform discrete Fourier transform (NDFT) and integrate it with the BCC approach to improve the decoded auditory image. Furthermore, a new subjective assessment method is proposed for the evaluation of auditory image widths of decoded signals. The test results demonstrate that the NDFT-based scheme can achieve much wider and more externalized auditory image than the existing BCC scheme based on the discrete Fourier transform (DFT). It is found that the present technique, regardless of the image width, does not deteriorate the sound quality at the decoder compared to the traditional scheme without ICTD estimation. Since 1990, joint stereo coding algorithm has been widely used in the two-channel audio coding. Various techniques have been developed for compressing stereo or multichannel audio signals. Recently, the ISO/MPEG standardization group has published a new audio standard, that is, MPEG Surround, which is a feature-rich open standard compression technique for multichannel audio signals . MPEG Surround coding can be regarded as an enhancement of the joint stereo coding and an extension of BCC [[2, 5]]. BCC exploits binaural cue parameters for capturing the spatial image of multichannel audio and enables low-bit-rate transmission by transmitting mono signals plus side information in relation to binaural perception. BCC is based on the spatial hearing theory , which uses the binaural cues such as interaural level difference (ILD), interaural time difference (ITD), and interaural coherence (IC) for rendering spatial audio. For multichannel audio signals, the corresponding spatial cues contained in signals, disregarding playback scenarios, are ICLD, ICTD, and ICC. Generic BCC scheme is illustrated in Figure 1. 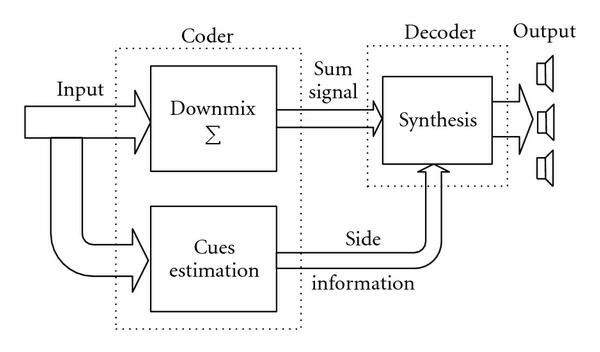 As input multichannel audio signals are downmixed into mono sum signal, side information which comprises some interchannel cues is also analyzed and obtained, and then both sum signal and side information are transmitted to the decoder. Finally, these cues are generated from the side information, and based on them BCC, synthesis generates the output multichannel audio signals. The detailed system implementation and variations of BCC are presented in . For BCC scheme applied to loudspeaker playback or amplitude panning signals, the use of time difference cue hardly plays an important role in widening and externalizing the auditory image. Furthermore, the introduction of ICTD may result in poor audio quality if it is operated improperly. Thus, the ICTD panning is not commonly used compared to the ICLD. However, for binaural recordings or signals filtered with head-related transfer function (HRTF), time difference cues contribute much to a higher audio quality . Especially, at frequencies below about 1–1.5 kHz, the ICTD is an important binaural cue for headphone playback . It is validated in the subjective test of Section 5 that the spatial image width could be widened significantly and a better overall quality could be achieved compared to the BCC scheme without using the time difference cue. Generic BCC scheme estimates ICTD in frequency subbands partitioned according to psychoacoustic critical bands . When DFT is used to implement time-to-frequency transform, the subband bandwidth in the range of low frequency is much narrower than that in the high frequency range due to the uniform sampling. However, to account for human auditory perception, spatial cues contained in low-frequency subbands are more important than those in high-frequency subbands. The DFT method may not analyze subband properties properly so that the BCC scheme with the ICTD estimation is unable to improve the audio quality and even deteriorates it. An alternative solution is to employ the nonuniform discrete Fourier transform (NDFT). The advantage of the NDFT is that localization of frequency bins can be adjusted as requested. In this paper, we propose a novel NDFT-based method to estimate ICTD more accurately than in the DFT-based solutions. Firstly, a subband factor is calculated to evaluate the coherence degree of two channels and then decide whether it is necessary to estimate ICTD. A new subjective testing is designed to assess the proposed BCC scheme from many references to  and results are in accordance with expectations. The rest of this paper is organized as follows. Section 2 introduces the concept of NDFT. Section 3 discusses ICTD estimation based on DFT. Section 4 presents the improved ICTD estimation. Subjective tests are described in Section 5. Finally, a brief conclusion is drawn in Section 6. Traditional DFT is obtained by sampling the continuous frequency domain at N points evenly spaced around the unit circle in the -plane. Therefore, if the temporal sample rate and are fixed, all the frequency points are uniformly distributed from zero to the temporal sample rate. From the point of view of the human auditory perception, the main drawback of this approach is the use of an equally spaced frequency range which leads into a transform of the whole frequency spectrum for the sampling rate as a constraint. Different from the uniform DFT, NDFT enables the analysis of arbitrary frequency ranges with irregular intervals. N frequency points of NDFT are nonuniformly spaced around the unit circle in the -plane. By choosing the frequency points appropriately, NDFT can change the distribution of frequency points in different subbands. It is possible to increase the frequency points in low-frequency bands and accordingly decrease those in high-frequency bands. Improved frequency accuracy may be helpful for spatial hearing. where and are the number of frequency sampling points and temporal sampling points, respectively. may be any real number between 0 and . It is known that the difference between DFT and NDFT is mostly the manner of frequency sampling, that is, the selection of . It can be seen that NDFT is a generalization of the conventional discrete Fourier transform. It is possible to adjust the sampling accuracy in different frequency bands, which is the essence adopted in this paper. Because of the requirement of real-time data, audio signals are processed frame by frame. Traditional BCC scheme implements time-to-frequency transform via DFT (FFT). The analysis window is depicted in Figure 3. The solid line represents the Hanning window for the current frame. The zero-padding parts to each side are not given in the figure. The dashed lines show parts of Hanning windows for the previous two frames and the next two ones. Each frame contains temporal data which is windowed by a Hanning window with a length of zeros are padded to each side and the overall length is There are 50% overlapping between adjacent frames. This means that the first half of the data of the current frame is overlapped with the second half of the data of the previous frame. Actually, it is shown in Figure 3 that all the temporal data are windowed by a weight of a constant value 1. Therefore, there is no need to add a synthesis window in the decoding end. Perfect reconstruction can be achieved without a synthesis window. In our schemes, the value of is 896 and the value of is 64. Thus, a 1024-point DFT is carried out to get frequency data. It should be noted that all signals selected have the same sampling rate of 44.1 kHz. After time-to-frequency transform, two-channel signals are downmixed into mono sum signal. Meanwhile, BCC cues are estimated in frequency subbands. According to the spatial hearing theory, a nonuniform partition of subbands is chosen. As the spectrum is symmetric, only the first (513 for 1024-point DFT) spectral bins are divided into subbands. In this paper, we use 27 subbands to approximate the psychoacoustic critical bands. Table 1 shows the number of spectral bins and the index of the first spectral bins in each subband. Table 1 Partition of subbands for DFT. Using (9) and (11), we can estimate the ICTD. From Table 1 in Section 3, it is noted that the number of spectral bins differs greatly between subbands. There are more spectral bins in high-frequency subbands than those in low frequency subbands. Thus, the estimated ICTD in low-frequency subbands may not be correct because of few spectral bins obtained. 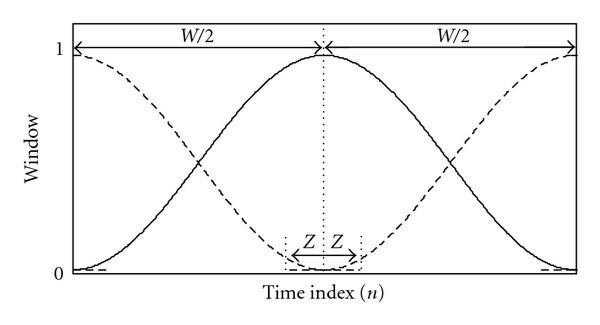 Moreover, when left and right channels are not fully coherent, that is, no time difference between the two channels, the ICTD may be estimated as a nonzero value. Here, an NDFT-based method is proposed to improve the ICTD estimation. Given the frequency width is 1 and the number of spectral bins is , uniform DFT mapping is shown in Figure 4(a). For NDFT method, proper are chosen to realize the nonuniform mapping from frequency width to the number of spectral bins. On the one hand, the bins in low-frequency subbands are increased by 2 times. On the other hand, they are appropriately decreased by half in high-frequency subbands. Meanwhile, they are unchanged in middle frequency subbands as depicted in Figure 4(b). This means that the number of the selected is fourfold between 0 and while unchanged between and . In order to keep the same overall number of sampling points with the DFT-based scheme, the number of is correspondingly reduced by half between and . Above in the unit circle, are selected symmetrically to the first half part. Comparison of mapping between DFT and NDFT: (a) DFT mapping, (b) NDFT mapping. For the convenience of comparison, our NDFT-based scheme is also based on a 1024-point transform. In the NDFT method, spectral bins are also partitioned into 27 subbands as shown in Table 2(a). Obviously, the number of spectral bins in each subband is different from the DFT scheme. Correspondingly, the index of the first spectral bin in each subband is given in Table 2(b). Table 2 Partition of bins for NDFT. where is chosen as 1/4 in low-frequency bands, 1 in middle frequency bands and 2 in high-frequency bands, respectively. Then we can estimate the ICTD in each subband using (10). An empiric value 0.5 is chosen for . If is larger than 0.5, ICTD is calculated as side information. Otherwise, ICTD is not considered in the NDFT-based scheme. Subjective tests are conducted using the guideline by ITU-R 1116 and ITU-R 1534 [11, 12]. There are 12 persons (including 3 females and 9 males, who are all volunteers in our group) participating as subjects in the test. Being trained, most of them are experienced listeners. The playback we used is TAKSTAR TS-610 headphone connected to an external sound card (Creative 24-bit Sound Blaster Live). case D:without ICTD, the BCC analysis and synthesis only with ICLD and ICC. Each subject should grade excerpts in two aspects. On the one hand, it needs to estimate reconstructed image width of audio signals synthesized by BCC. On the other hand, subjects should assess the overall audio quality. The image width and the overall quality are both measured by 5 scales. The scales for overall quality are shown in Table 3. Scores are given by subjects completely according to their personal perception. It is difficult for the quantitative image width evaluation, and there is not proper method to judge how the auditory image width is. 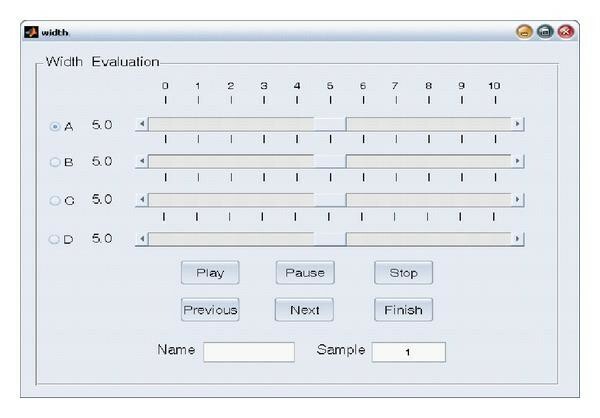 In this paper, a novel evaluate method is proposed by designing the MatLab user interface as shown in Figure 5. MatLab user interface for width evaluation. where is valued within the range from 0 to 5. As the reference has the widest auditory image, the value of is not 5, and is always less than . Moreover, as the corresponding auditory events are chosen at the same temporal point, the left and right channels would not be interchanged, which is confirmed in our tests. The use of (14) makes it convenient for image width assessment as well as the audio quality evaluation. Subjective test results for the evaluation of image width and overall quality are shown in Figures 6 and 7, respectively. Both the corresponding means and 95% confidence intervals are marked. It can be seen from Figure 6 that the scheme without ICTD results in a worst auditory image for all excerpts with lowest scores, because the synthesizing process compresses the image width of original signals. The auditory image widths of excerpts are difficult for subjects to perceive due to the wider 95% confidence interval. Obviously, the scores of the NDFT-based scheme are the highest in the three processed schemes. These excerpts are most approximate to original signals with a wider auditory image rather than the other two kinds of excerpts. 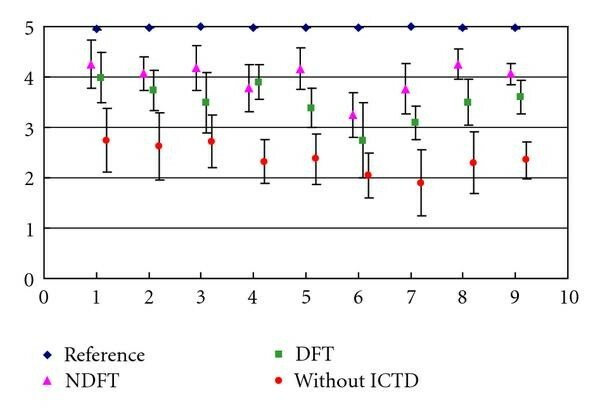 It means that NDFT-based ICTD estimation is more accurate than the DFT-based one as expected. The average scores in the four cases are depicted in the right part of Figure 6, where the value "9" in the abscissa represents "average." The average score for the case B, C, and D is 4.3, 3.9, and 3.2, respectively. It validates that the NDFT-based scheme is superior to the DFT-based scheme. Results for the overall quality evaluation are shown in Figure 7. Generally, the schemes without ICTD may have the best audio quality disregarding image width. But it may change auditory image, and the decoded audio will not gain an ambient image, which affects the perception quality more or less and lead to a significant difference to original audios. Therefore ICTD estimation should be adopted in BCC schemes for improving the overall quality considering image width. 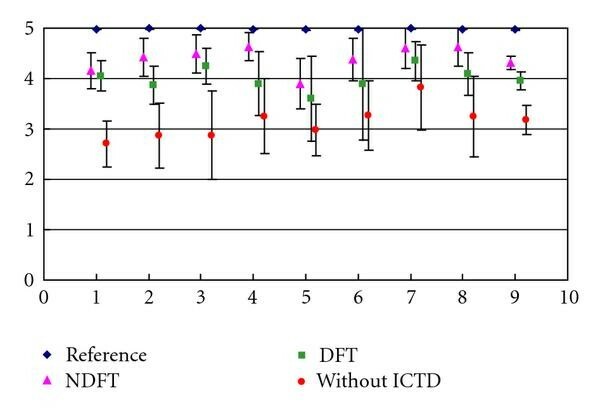 It is clear from Figure 7 that the scheme without ICTD has the lowest scores and the average value is 2.3, whereas the BCC scheme with DFT-based or NDFT-based ICTD estimation has an advantage over it. Moreover, the NDFT-based scheme yields higher scores than the DFT-based scheme except for the excerpt sample 4. It is from the right part of Figure 7 that the average score for the DFT-based scheme and NDFT-based scheme are 3.6 and 4.1, respectively. Obviously, NDFT-based scheme is better than the DFT-based scheme, and it is the best choice in terms of the audio quality and image width. This paper presents a novel algorithm to estimate the interchannel time difference by using the nonuniform discrete Fourier transform. The frequency bins can be adjusted as requested by integrating this algorithm with the binaural cue coding approach. Consequently, the decoded audio image width is improved compared to the traditional DFT-based method. On the other hand, the sound quality is not deteriorated by adding this algorithm module in the BCC scheme. A subjective testing was designed and implemented. The evaluation result proves that this NDFT-based ICTD scheme is the optimal choice in terms of the audio image width and the audio quality. This research was partially supported by the National Natural Science Foundations of China under Grants no. 10474115 and no. 60535030.